Relax, unwind and discover a world of affordable dental care at our dentists in Bahia de Banderas. This beautiful part of the world, translated as the Bay of Flags, is easily accessible from the US and Canada, and is home to one of Mexico’s most fashionable resorts – Puerto Vallarta. Located on the Pacific Ocean, there is also an abundance of quiet beaches and pretty towns and villages on and around this 62 mile (100 km) stretch of coastline just waiting to be explored. Bounded by Punta Mita (Mita Point) in the north and Cabo Corrientes (Cape Corrientes) in the south, beneath the tranquil, warm waters of the Pacific Ocean is a marine world teeming with life – great for diving and snorkeling, and for spotting some of the area’s larger visitors, such as the humpback whale. Pastimes on – or in – the water, are the order of the day here, and there is more than enough to keep most people occupied, even if it’s just dipping a toe into the gently lapping, warm ocean waves as you meander along the beach. On the water sea kayaking and sailing boats can be hired or chartered, and there is nothing like seeing the setting sun from the deck of a luxury sailboat with a cocktail in your hand after a day exploring. Secluded beaches on tiny islands with rocky caverns and unique flora and fauna can be accessed by boat or kayak, and there are also a wide variety of ecotours for finding dolphins, giant manta ray, tropical fish and indigenous birds. Inland the jungle-clad Sierra Madre mountains provides the perfect environment for more wildlife spotting and outdoor activities, including canopy tours, ziplining and off-roading in all terrain vehicles. Of course, the area is not just about high-octane pastimes – there are more sedate activities on offer too – including championship golf courses with amazing ocean views, shopping and a huge array of restaurants. As a dental holiday destination, Bahia de Banderas ticks all the boxes with regard to scenery, things to do and relaxation, but more importantly, you have a wide variety of well-qualified dentists and modern clinics to choose from to make your stay one to remember. Where is the Bahia de Banderas? Bahia de Banderas is on Mexico’s west coast, overlooking the Pacific Ocean. Although not quite the largest bay in Mexico, the locals think it is, extending for 62 miles (100 km) from Punta Mita in the north to Cabo Corrientes in the south. Why visit a dentist in Bahia de Banderas? If you’re looking a classic dental vacation relaxing by the beach, Bahia de Banderas will not disappoint. For North Americans, the added bonus is that it is not a long-haul flight away – with flights from the southern States taking less than 3 hours. With many of our clinics open at weekends it is not unreasonable for some of our patients to visit just for the weekend, and Bahia de Banderas is certainly near enough to do that for many. We have an increasing number of high-quality dental clinics partnering with us throughout the area, in the less well known but growing tourist towns such as Bucerias. Alongside the clinics we have in more established destinations, such as Puerto Vallarta, our dentists in Bahia de Banderas offer choice, high-quality and affordability. The beautiful ocean views and beaches are the focal point for many luxurious 5* resorts offering spa and wellness treatments, as well as the more modest 3*accommodations. You will also find plenty of boutique accommodations located in the towns along the Bahia de Banderas coast, which are perhaps a little less expensive without the ocean views. There is no US travel advisory specifically for the Bahia de Banderas or Riviera Nayarit coastal regions and these areas are safe to travel to. The area is partly in the State of Nayarit and partly in the State of Jalisco. The Advisory does warn against travel to the parts of Nayarit that border the states of Sinaloa or Durango, and in Jalisco the parts that border the states of Michoacan and Zaacetas. Fortunately, these are a long way from the Bahia de Banderas coastal regions. Take a look at our high definition clinic photos and see how they compare to your own dentist at home – just on looks alone many of the dental clinics in Bahia de Banderas are far superior! These checks include legal and criminal background checks, authentication of qualifications and professional memberships, as well as verification of patient reviews. Taken together all these different checks give us a pretty good overall picture about the quality of a particular dentist or clinic so we can feel confident to promote them on our site. We try to give our patients as much information as we can to help them make an informed choice. Traveling abroad for dental care is no longer the hit and miss affair that it once was. Today’s dental tourists are usually already well-traveled. Visiting another country is not an out-of-the-ordinary event, and other cultures not so unfamiliar. It is also fair to say that globalization has increased the needs for standardization, and this is particularly true of medical and dental techniques, training and qualifications. A dentist in Mexico is just as likely to have had the same training and professional memberships as a dentist in the United States, which is great from a patient’s perspective. Yes – all of our dentists in Bahia de Banderas, and throughout the world, in fact, provide guarantees or warranties on the work they do, as well as on the materials they use. You can be safe in the knowledge that if something does go wrong (an extremely rare event) then it will be put right with no extra charge. What we will say here is that although our dentists’ warranties cover their work and materials, it does not cover any additional travel costs or accommodation charges you may incur if you have to travel back. For complete peace of mind we recommend taking out an insurance policy to cover you for dental complications, and we have teamed up with a number of insurance providers to offer this at reasonable prices. It is also worth remembering that no dental or medical procedure can ever be guaranteed completely. The human body is unique, and what works for one is not necessarily the case for another. That said, you can always reduce risk by booking with a reliable dentist who is experienced and has the skills required for your particular dental problem. This is why choosing a quality-checked dentist is so important, and why we feel Dental Departures is a cut above the rest. Furthermore, Dental Departures really does commit to customer service and will gladly take up any issue you have with your treatment on your behalf. We are here to be your advocate, and to ensure you have the best experience of our services as possible. Although any attempt to speak Spanish will be welcome, it isn’t necessary at our dentist’s offices where English is spoken widely. Most tourist areas are well equipped to deal with English speakers too. Our dental clinics in the Bahia de Banderas accept a variety of payment methods, although most accept US dollars. Check on our website for each individual clinic’s preferred other methods, which may include personal and traveler checks, bank transfers, debit cards and credit cards. Please note credit card transactions usually incur a small additional processing charge of 3-4%. If you have insurance it is unlikely that your dentist in Bahia de Banderas will be able to bill your insurance provider directly as they probably won’t be in your provider’s network. However, you may be entitled to claim back your expenses once you have returned home if your insurance company allows for out-of-network expenses. You will need to check your policy or speak with your provider to find out, and to get hold of any paperwork you may need to bring with you. 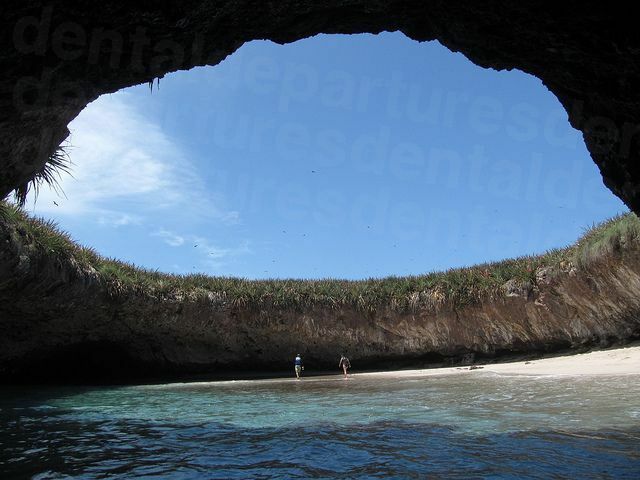 Our dentists in the Bahia de Banderas are open throughout the year, and the climate is good all year round. Summer months, June-October, sees the highest temperatures of up to 32C (90F), with tropical downpours, generally in the late afternoon/early evening. The winter weather is exceptionally clear and sunny, with almost perfect temperatures of around 27C (80F), which are not too hot for daytime activities, nor sleeping temperatures at night. Some places are accessible, and some not so much. There are many new hotels of which many are wheelchair-friendly, but equally some of the smaller villages or towns may be difficult to navigate. Most of our dentists do have wheelchair-friendly facilities, and we are always more than happy to get you to one of them if you’d like to get in touch with our Customer Care team. Standard pain relief in Mexico might not be the same as you would get at home. In Mexico, local anesthetic is the preferred method, rather than sedation dentistry, which many foreign patients may have at home. Many of our dentists do provide sedation dentistry as an option, but it will incur an additional fee of around $400 as the services of an anesthesiologist will need to be booked for the procedure. Please speak with our Customer Care team if you require this service as it will have to be booked in advance. Likewise, if you require prescription medication such as Valium, this will need to be ordered in advance too. What else is there is Bahia de Banderas? The Bay of Flags’ most obvious charm is its natural setting, and the variety of wildlife that can be encountered both on land and at sea. The Los Arcos National Park is a protected natural area, including the beaches of Yelapa, Majahuitas, Las Caletas, Quimixto, Las Animas and Colomitos. Each offers its own speciality, such as horseriding at Quimixto, snorkeling at Colomitos, Kayaking at Las Animas and a crystal clear pool and waterfall at Yelapa. Los Arcos (the arches) are actually small granite islands protruding from the sea, and the National Park provides a protected area for the variety of biodiversity found in the area. All sorts of marine life is clearly visible in the crystal waters, and there are all sorts of seabird species, including pelicans, parrots and penguins. One of the areas attractions is the array of towns and villages dotted along the coastline, each with their own particular style and attractions. Bucerias is laid back, some say what Puerto Vallarta was like around 40 years ago. Thursday night is art walk night, where local galleries open their doors in the evening and serve cocktails and refreshments to visitors. The cobblestoned streets are not the only hive of activity here. The beach is also bustling with distractions such as sand figure competitions, and it’s hard to resist the local freshly caught fish delicacies, including pescado zarandeado, shellfish and lobster. 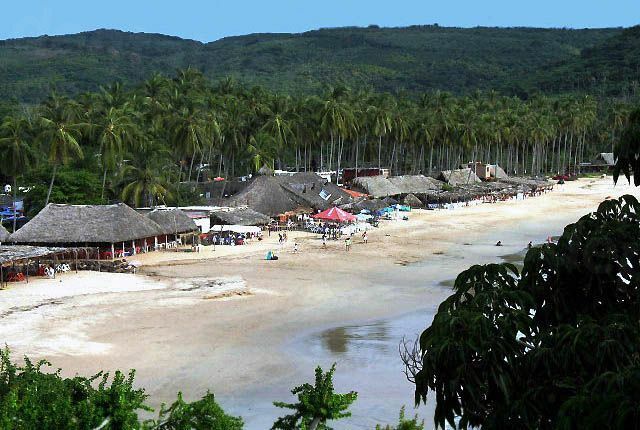 La Cruz de Huanacaxtle also has beautiful beaches fringed with palapa restaurants. The weather is slightly cooler here and its marina and harbor have made it a firm favorite for visitors arriving by boat from Canada, the United States and Europe. The established Puerto Vallarta and the newer Nuevo Vallarta with its all inclusive resorts and high-end hotels also offer other attractions such as the theatre, cinema and shopping malls, as well as plenty more restaurants and bars. 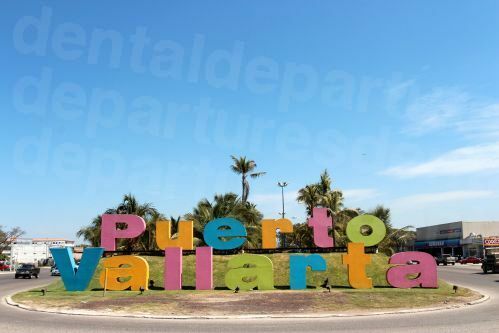 The nearest international airport is in Puerto Vallarta (PVR), almost in the center of the bay. You can book an appointment with one of our dentists in Bahia de Banderas online, via our toll-free number, or with our online chat. You can also send us an email too, if you prefer. Don’t hesitate to get in touch with one of our Customer Care team if you have any questions. Our friendly and knowledgeable team are always here to assist you in getting an appointment with one of our quality-checked dentists at the best prices available.